Psychological resilience has emerged as a highly significant area of research and practice in recent years, finding applications with a broad range of different groups in many settings. Contemporary discourse is not limited to ways of effective coping with adversity but also introduces mechanisms that can lead to enhanced capacity after dealing with difficult circumstances and recognises the importance of enriching the field with varied perspectives. 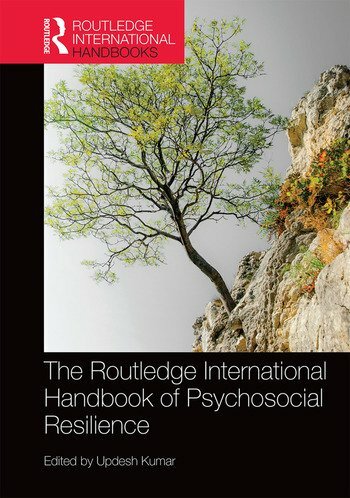 The Routledge International Handbook of Psychosocial Resilience is a comprehensive compendium of writings of international contributors that takes stock of the state-of-the-art in resilience theory, research and practice. The Routledge International Handbook of Psychosocial Resilience covers the many different trajectories that resilience research has taken in four parts. Part One delineates the ‘Conceptual Arena’ by providing an overview of the current state of theory and research, exploring biological, psychological, and socio-ecological perspectives and discussing various theoretical models of personal and social resilience. The ‘Psychosocial Correlates’ of resilience are discussed further in Part Two, from personal and personality correlates, socio-environmental factors and the contextual and cultural conditions conducive to resilient behaviour. In Part Three, ‘Applied Evidences’ are introduced in order to build upon the theoretical foundations in the form of several case studies drawn from varied contexts. Examples of resilient behaviour range from post-disaster scenarios to special operation groups, orphaned children, and violent extremism. Finally, Part Four, ‘Proposed Implications and Resilience Building’, sums up the issues involved in discussing post-traumatic growth, wellbeing and positive adaptation in the varied contexts of personal, familial, organizational and societal resilience. The volume provides a comprehensive overview of resilience theory, practice and research across disciplines and cultures, from varied perspectives and different populations. It will be a key reference for psychiatrists, psychologists, psychotherapists and psychiatric social workers in practice and in training as well as researchers and students of psychology, sociology, human development, family studies and disaster management.